Pythonanywhere has one click button at the web tab that will do all this stuff for you. Just click where it says Web2Py, fill in your admin password, and you're good to go. Pythonanywhere is very simple to set up and use. I have been using their service for over 4 years now (2 years paid) and I have 5 sites hosted there. Price is very reasonable and My website hardly ever use 3000 seconds of CPU monthly allowance. Note, their service does go down ranging from 10 seconds to 20 minutes, but generally it is down for a 1 minute. On 01.04.2016 uptime robot shows 98.92% (last 24 hours) 99.52%, (last 7 days) 99.58% (last 30 days). Generally reasons for downtimes are: Gateway Timeout (504), Connection Timeout, Service Unavailable (503), Bad Gateway (502). Regardless of the downtime, I'm very happy with the service, customer service and the price. Disclaimer: there is a possibility that some of downtimes are not caused by pythonanywhere service. This assumption is made based on other websites experiencing the same problem at the same time, e.g. 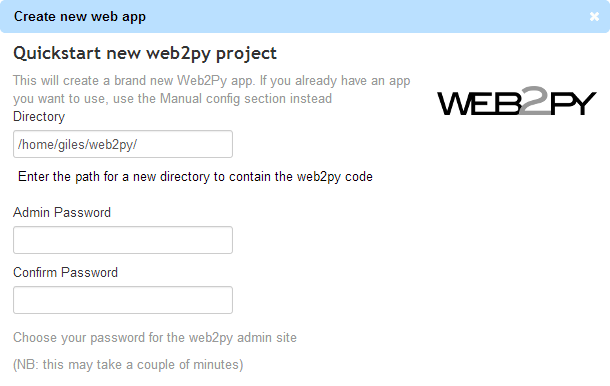 www.web2py.com or www.web2pyslices.com who are also hosted by pythonanywhere. Moreover, this post is not sponsored by pythonanywhere. However, web2pyref has subscribed to pythonanywhere affiliation program.